"Inevitably, somebody's going to squeeze the toothpaste the wrong way, and somebody's going to get upset. Eventually, feelings are going to get hurt." "I think Bobby and Tori will be fighters. If Chad wasn't so calm and easygoing and always so ready to admit he's sorry, even if he didn't do anything wrong, it would be easier to fight with [him]." In this web exclusive, Gil and Kelly discuss their first fight, and Erin shares the real reason why her arguments with Chad are limited. So true! Everyone has arguments and I agree with Erin about the newlyweds. Erin and Chad look so happy- such a great couple. Kelly is always so wise. And Chad&Erin are always so REAL! They speak from the heart... not scripted. Love this clip! And love your comment! I agree with Erin- Couples with strong personalities tend to argue. Just an observation of course, but Bobbie seems to be going along with everything for now. But that might change in the future. I don't think we'll see that aired on UPTV though. I think there's a quiet strength to Bobby. He decided not to take the job at the church any further than helping Gil instead taking a job in another state(sorry can't remember where) starting next month. So Bobby is taking his wife,Tori away from the family. Gil and Kelli bates marriage is such a wonderful example! One day, Chad will explode. I have seen this happen over and over again with various married couples. It's inevitable that one finally 'has had it'. It's not pretty when that happens. Neither one should always put up. There must be a reason that Chad feels that he has to be the one to always back down first. Only he knows what that is. 7:23- There are some people who simply try to avoid conflict at all costs. On the other side of the coin, there are those who seem to thrive on it. Marriage is definitely a balancing act! I'm not sure if he will explode I'm more concerned in years to come he will burn out. The exploding only comes if a person is letting things that bother them build up. Some people are just laid back and don't take things personally. They don't tend to wind up exploding. 4:53 I wonder too about Chad burning out someday. It will probably be a "when" not an "if". And it will probably be gradually, not "one day like this and one day like that". Sometimes us wives need to give in once in awhile to our husbands. Definitely not " take" all the time. Idk, I'd have to see more of their marriage before I proclaim judgements. What I see for now is Erin taking care of Chad physically (cooking, laundry, taking care of the house and children, etc) but maybe she could do better with the emotional end for Chad. I hear her praising him a lot tho! I've been watching that and wanting to do better in that area for my husband! 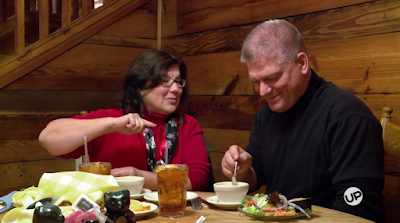 Interesting they even admit to conflict in marriage, or that Bobby and Tori will be fighters. They try desperately to showcase marriage as total fantasy land if you only court instead of date, no kissing before marriage, and cling to each other in every post. I think that the Bates have been pretty honest about how relationships are not perfect. And they also let their kids decide a lot of things about relationships instead of making up a bunch of rules for them. Why would you even follow the blog if you have such strong opinions about how they live? I agree with 11:24. Gil and Kelly are very real about their family life. The main message I get from their show is that "life may be busy, life may be messy, and we're not perfect, but we're committed to working on growing as a family and loving each other." 5:06?? Your statement is nonsensical. I never said anything about having strong opinions about how the Bates should live. I said it’s interesting they admit to conflict and fighting as they try very hard to portray utopia within marriage if you follow A,B,and C rules. While there seems to be more freedom given by Kelly Jo and Gil( versus Duggars) toward their children dating, it is a far stretch to say they don’t make up a bunch of rules. An unmarried adult is still required to have a chaperone for goodness sake! I think maybe you need to dial it down a bit and not be so easily offended. It’s nit good for your health. I've never gotten the impression that the Bates are trying to "showcase" themselves as having perfect marriages or toutting their version of courtship as some guarantee for marital happiness. I do recall Michael made some pretty idealistic comments in her wedding themed episodes, way back when. But that was her, she did not claim to speak for every Bates. Note that Michael did strictly follow all the courting rules, quietly waited for years for Brandon, and they did not date at all, they behaved as totally platonic friends before they courted. But that seems not to be the case for her younger siblings. Indeed, her younger siblings are routinely discussing "dating" in their interviews, with "courtship" seen more as pre-engagement, with the actual engagement consisting of just a few months of wedding planning. Even Kelly Jo recently mentioned how the older kids are "dating". So they don't seem to be totally against dating anymore. Though certainy the Bates version of a date is still chaperoned and sometimes it can be silly (such as when Carlin went to visit Evan with a chaperone, even though he is still living with his family, so it's not like she was going to be alone with him if she didn't bring her own chaperone). Michael was 23 when she started courting Brandon. Hardly waiting for “years”!! Michael actually did wait for years between the time she first started liking him and when they got married. They waited while he was finishing Bible school. Their relationship history did go on for years before marriage. This is Anon at 753 again. Yes, she started courting Brandon at age 23, but met him at Bible camp 4 years before that when she was 19. Yet she didn't think Brandon returned her interest; when Gil told her a young man wanted to court her she had no idea that it was him. All this is posted on the Keillens official website. Also while this is not on her site, I recall from the show that when Brandon asked her to marry him she replied "I've wanted to from the moment I met you"! The story on her website is more nuanced than that and refers to a 3 year period of her falling for and pining for him, yet doing nothing except praying about it, because she did not want to "lure" him into a relationship. Some of the language she uses is very flowery and idealistic and not how she talks on TV. The main point is that there was no "let's be special friends" or "let's go on dates with chaperones and just not call it dating" pre-courtship period the way the younger Bates have conducted their relationships. Josie started that process when she was only 15. So I just get the sense that while there are Bates rules they are allowing their children some flexibility in how they navigate romantic relationships. Not just saying "this is the ideal way to find a spouse and if you follow it, you are guaranteed a perfect marriage". Which was the charge the poster I was responding to made. Most people who "wait" until say age 28 to marry are NOT waiting to kiss their partners on the wedding day. Many have been living together for years and might even have kids already. So what exactly are they waiting for? Just a chance to throw a big party? I'm not sure you get credit for "waiting" to marry if you're enjoying all the perks of marriage before the ring goes on your finger. Wow @5:33. I wasn’t a “pure perker” when I got married. And, yup, threw a big party! I’ve been married almost 30 years. Do I get any “credit”? ?